I salvaged a beat-up, old kitchen cabinet from a construction site and used it to make this concrete planter on wheels. This is a simple project that requires some heavy lifting. I used 2” thick XPS rigid foam boards to make the inside of the form. Heavy duty metal casters and a chrome spigot make it easy to move and drain, while providing a fun industrial aesthetic. Use it as a mobile herb garden or fill it full of ice and beer for your next party. I used almost 2 bags of Quikrete 5000, so the planter weighs about 150 lbs. 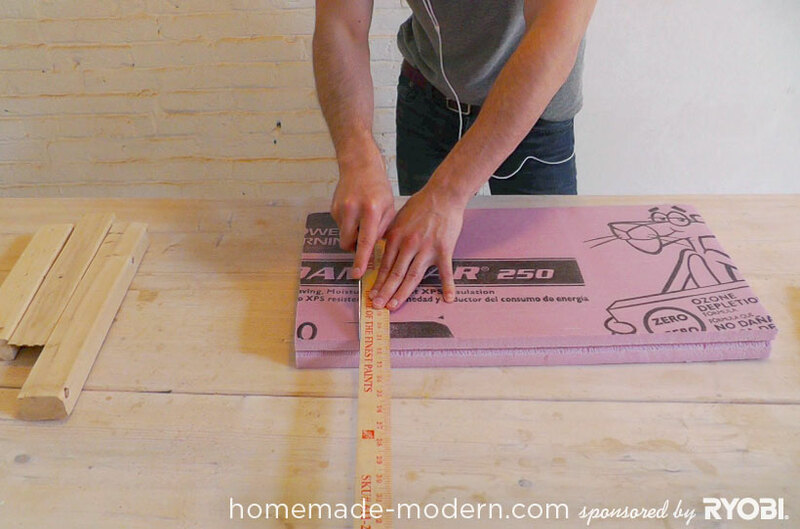 XPS Rigid Foam is a type of waterproof insulation that is easy to cut. I used brass pipes to avoid rust. The pipe should be long enough to go through the planter's wall. I also got a threaded nut for the pipe. I used all metal, heavy duty casters for their strength and industrial look. Plastic or rubber wheels would be easier on a deck or floors. You could even try old skateboard wheels. I cut a piece of 3/4" plywood to create a mounting surface for the casters. 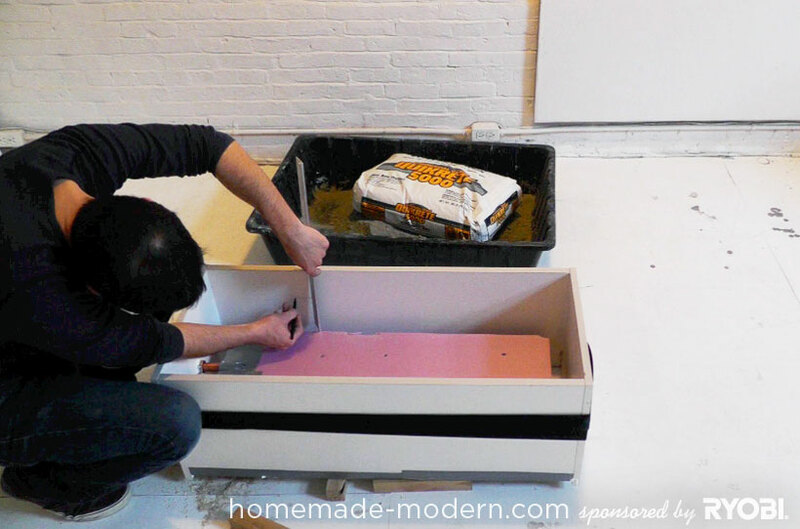 I used Liquid Nails Construction Adhesive and silicone caulk to glue down the foam and seal the mold. I used a spigot but a hose bib could also make the planter easier to drain. 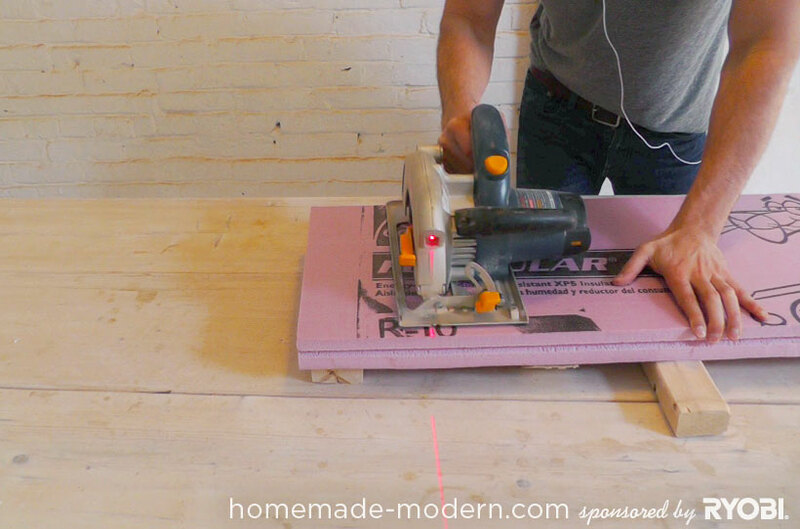 You can make this project a little cheaper and easier without it. Cut 3 pieces of the rigid foam to fit inside the cabinet. Leave about 1 1/2" to 2" of space between the foam and the cabinet. Measure the distance from the edge of the cabinet to the top of the foam. Mark that distance on the exterior side of the cabinet and where the center of the hole should be. Drill thorugh the cabinet and insert the pipe. I used duct tape and silicone caulk to seal the pipe to the foam and the edge of the cabinet. Depending on the condition of the cabinet being used, you may need to brace it with L brackets or rope. I tied a ratchet strap around my cabinet to keep the weight of the concrete from pushing out the sides. Mark a line about 2" above the top of the cabinet. This will serve as a guide to let you know when you have added enough concrete. Mixing this much concrete is hard work and you may be tempted to over water the concrete to make it easier to work with. If you add too much water, the concrete will be weak and could crack. 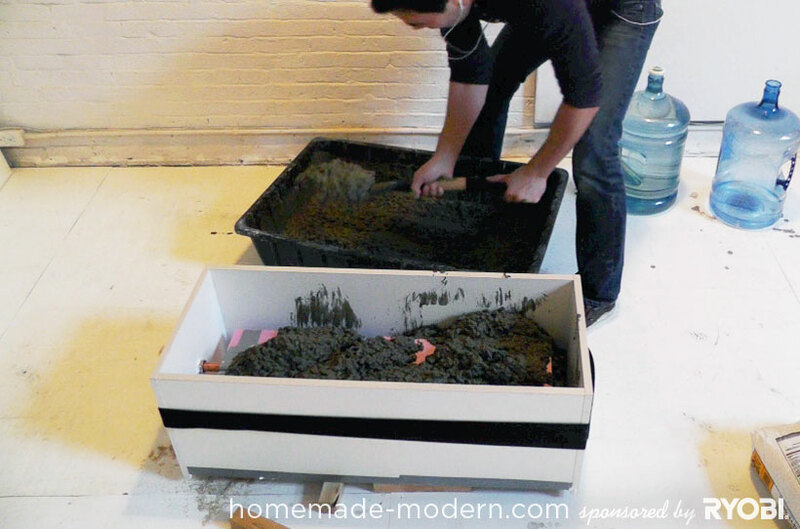 Mix the concrete until it is the consistency of wet cookie dough and pack it down into all the corners and cracks of the cabinet. Make sure the wet concrete goes under and around the pipe. 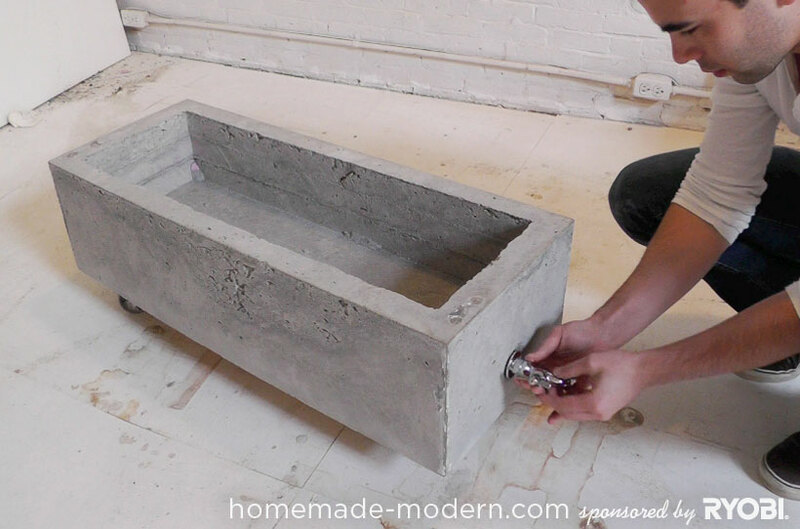 Use a stick or pipe to push the concrete down. Use a hammer to shake and vibrate the mold. This will bring air bubbles to the surface of the concrete. 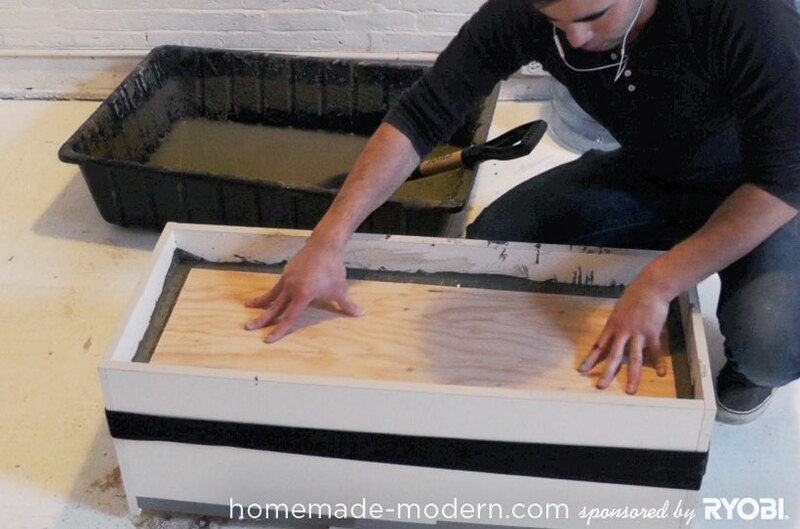 I placed a piece of plywood – the same size as the foam – on top of the wet concrete and pushed it down to be flush to the surface of the concrete. You may need to put something heavy on top to keep it from floating up. Let the concrete cure for at least 4 days before removing the form. The manufacturer suggests covering the concrete to control moisture, but I didn't and it came out just fine. 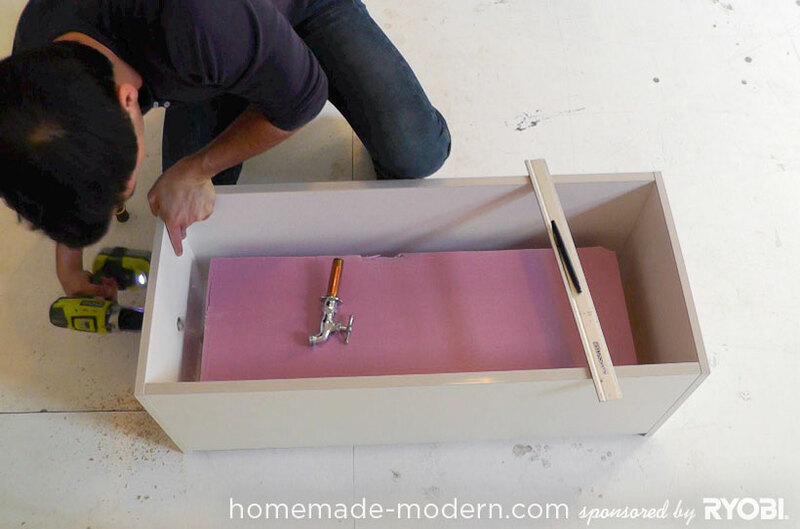 Gently break away the cabinet mold without cracking the concrete. You can use a circular saw to cut away the cabinet, if needed. 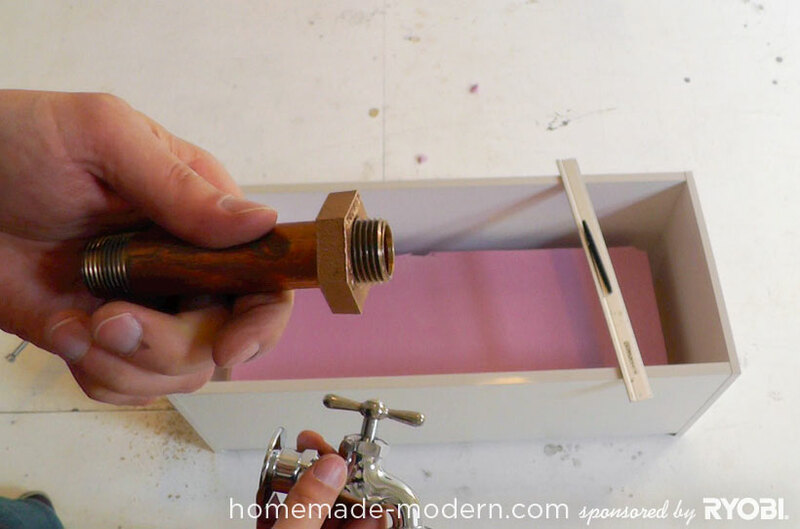 Use a knife and prybar to cut and break out the foam. 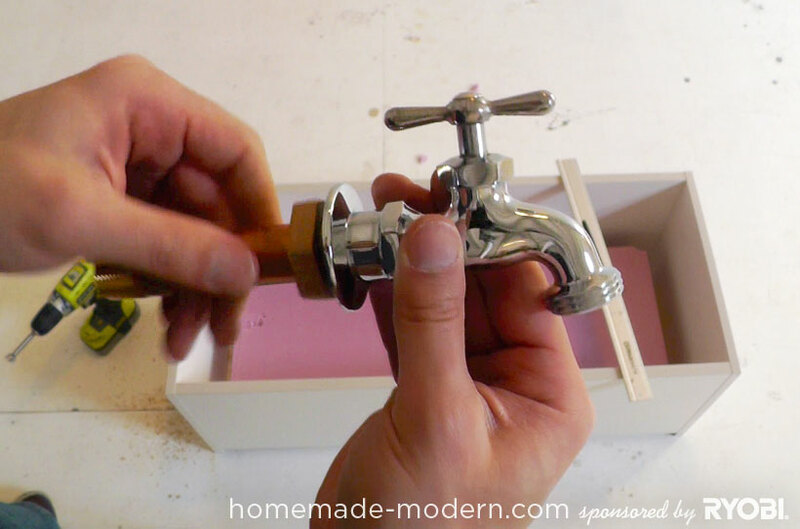 Screw the spigot on and seal it with silicone or latex caulk. You can also glue it on with Liquid Nails Construction Adhesive. Screw the wheels to the plywood and flip it over. 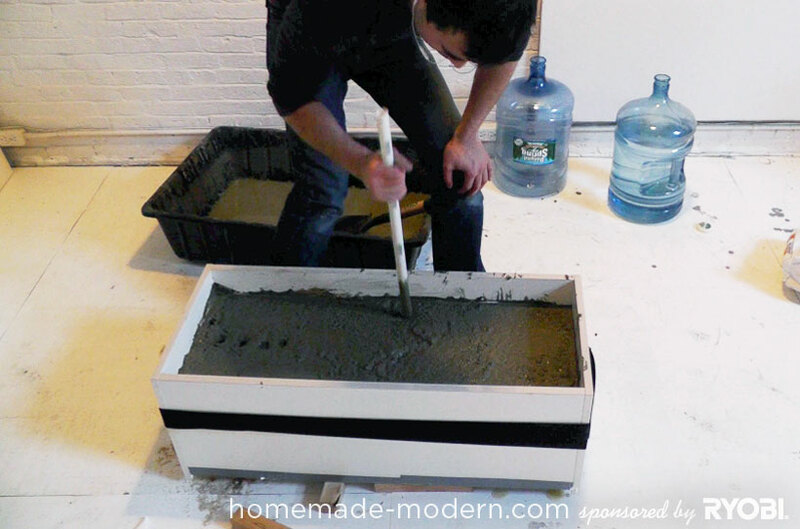 Good luck making your own concrete planter, and please email or tweet photos to @benuyeda or ben@homemade-modern.com. For more detailed instructions, dimensioned drawings and different variations of the project, check out our soon-to-be-released book.